Latinos have become considerably more upbeat about their personal finances and optimistic about their financial future since the Great Recession, according to newly released results from a national survey of Latino adults. The survey also shows that Latinos have pulled even with the general U.S. population in their views of their personal finances and continue to outpace them on optimism about the future. However, community economic indicators show limited progress since the Great Recession. 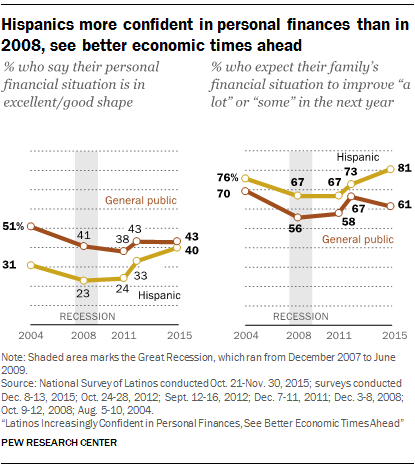 Four-in-ten Latinos say their personal finances are in “excellent” or “good” shape, a 17 percentage point increase since 2008, when only 23% made a similarly positive assessment of their finances (the Great Recession began in December 2007). 1 By contrast, the share of all Americans who have a similarly positive view of their finances remained essentially flat during the same seven-year period (41% in 2008 vs. 43% in 2015). The survey also shows that Hispanics are more upbeat in their financial expectations for the upcoming year than they were in 2008. About eight-in-ten Hispanic adults (81%) say they expect their family’s financial situation to improve in the next year, up from 67% who said the same in 2008. By comparison, the U.S. public is not as upbeat – 61% say they expect their family’s financial situation to improve, up from 56% who said this in 2008. These findings emerge from the 2015 National Survey of Latinos, a nationally representative bilingual telephone survey of 1,500 adults conducted on both landline and cellular telephones. It was fielded from Oct. 21 to Nov. 30, 2015, and has a margin of error of plus or minus 3.3 percentage points at the 95% confidence level. The nation’s Latino population is its largest minority group, numbering 55.3 million in 2014. They are also one of its fastest-growing groups – the U.S. Latino population grew 57% between 2000 and 2014. With this fast demographic growth has come a growing impact on the nation’s economy. Between 2009 and 2013, Latinos accounted for 43.4% of total jobs growth, with U.S.-born Latinos driving most of that job growth. And the group’s purchasing power is on the rise. According to the University of Georgia’s Selig Center for Economic Growth, the purchasing power of the U.S. Latino community was $1.3 trillion in 2014, a gain of 155% since 2000 and higher than that of blacks ($1.1 trillion) and Asians ($770 billion). Despite growing confidence and a larger economic footprint, federal government data shows a mixed economic picture for the Hispanic community recently. For example, the group’s unemployment rate has improved since the Great Recession (just as it has for all Americans), falling from a high of 12.8% in the first quarter of 2010 to 6.4% in the last quarter of 2015 (and 5.6% in the first quarter of 2016). 3 Still, it remains above its low of 5% in the fourth quarter of 2006 and is higher than that for non-Hispanic workers in the fourth quarter of 2015. At the same time, median household income for Hispanics has stagnated since the Great Recession—in 2014 it was $42,491, a level essentially unchanged since the Great Recession (income is also little changed among the U.S. public), according to the latest Census Bureau data. In addition, the same Census Bureau report shows that the Hispanic poverty rate – 23.6% in 2014 – is less than a peak of 26.5% in 2010 but remains above pre-recession levels (as it does for all Americans). 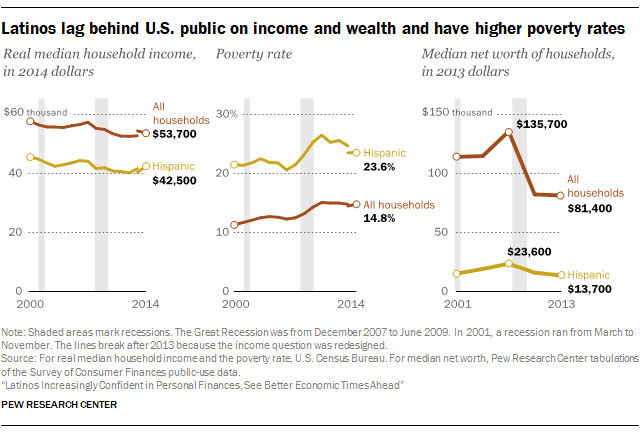 On wealth, Hispanic households had the largest percentage decline in their net worth through 2009 of any major racial or ethnic group. Unlike white households, however, their net worth continued to fall after the recession. Nonetheless, Hispanics remain upbeat about national economic conditions. According to a December 2015 Pew Research Center survey of U.S. adults, 35% of Hispanics said economic conditions today are good or excellent, a higher share than among whites (25%). And the same survey shows that one-third of Hispanics (34%) say U.S. economic conditions will be better in the coming year, a share about twice as high as seen among other groups of Americans. Economic issues have long been among the top issues identified by Hispanics when asked about those that are more important to them personally. For example, in 2014, the issues of education and the economy and jobs were rated more important than health care and immigration among registered voters. And on such issues as the minimum wage, Hispanics are more likely than the general U.S. public to support an increase – 84% versus 73%, according to the Pew Research Center’s December 2015 survey. In 2015, Latinos with some college experience or more (56%) and U.S.-born Latinos (50%) were most likely to say their personal financial situation is either excellent or good. Even though 59% of Hispanics ages 65 and older say they expect their family finances to improve in the next year, this is the lowest share among major Hispanic demographic subgroups. The terms “whites,” “blacks” and “Asians” are used to refer to single-race, non-Hispanic components of their populations. “U.S. born” refers to persons who say they were born in the United States, Puerto Rico or other U.S. territories. “Foreign born” refers to persons who say they were born outside of the United States, Puerto Rico or other U.S. territories. The terms “foreign born” and “immigrant” are used interchangeably.